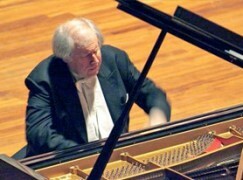 At last night’s recital by Grigory Sokolov in the Grosses Festspielhaus at the Salzburg Festival, as Sokolov was into the trio of the final menuet of Haydn’s 49th sonata, nearing the end of an all-Haydn first half, water began to pour from the ceiling onto the patrons in the 5-8th rows, center. I was sitting in the 1st row, directly in front of Sokolov, and was reluctant to turn around, not wishing to distract him…but of course the water was coming down loudly, as if from a large showerhead, pouring from one of the light fixtures high overhead, and it’s hard to believe he didn’t hear it. Nonetheless, I never saw so much as a glance or any other sign he was aware of the deluge – his commitment to the music was absolute – and his performance appeared in no way affected by the fact that roughly two dozen people had to get up right in front of him and quietly file out. After a slightly longer than customary intermission, during which the leak was stopped, the floor mopped, and dry seat cushions provided for the affected patrons – several of whom did not return – the program resumed with a stunning Schubert D.935, plus the usual generous complement of wondrous encores, six in all. The fourth of these was – naturally – Chopin’s ‘Raindrop’ prélude. Funny. Sokolov is a consummate professional …. and much more. … and all for 115,00 €. For playing of this caliber, €115 was a bargain. In context: there was a thunderstorm, with a “highly unusual” 14 liter water per square meter. Welcome to global warming, sadly. Here is some historical context. No just Salzburg! Horizontal rain like no other when I was a student at the Mozarteum in the 80s. And the whole week torrential rain when I was there singing in June 2014. I’ll have 4 performances at the Grosses Festspielhaus next week. Let’s hope the problem will be settled then. Sokolov has an unbelievable following, it seems that all his recitals are sold out and he plays the same program for the season. It was my first experience of his great art at the BOZART in Brussels in April. His fan club on Facebook makes interesting reading. I heard him in Prague a couple years ago and he was great. I haven’t heard of him playing the same program all year, but it makes sense; I’ve read where he said he doesn’t play a lot of concertos because every time you’re starting over with another orchestra, but with a recital you can pick up where you left off with the last performance and try to take it to another level. So playing the same pieces over and over again for a season, constantly honing them, would be consistent with that, even though it seems the pieces could lose their charm after so many repetitions. I think GS regularly tours one programme all year, a great way – as you say – to hone it as far as is humanly possible. Apparently, he hates being away from a piano for more than a day or so. In any case, we are the happy beneficiaries of his devotion. I reluctantly passed on the Haydn/Schubert programme this year but hope he returns next year with a bit of Brahms; I’d love to hear that. Charles Rosen attributed the quote to Paderewski: If I don’t play for one day, my fingers feel it; for two days, my friends can hear it; for three days, the whole world knows about it. Rosen says that Leopold Godowsky added a fourth day, on which “the critics find out about it”.